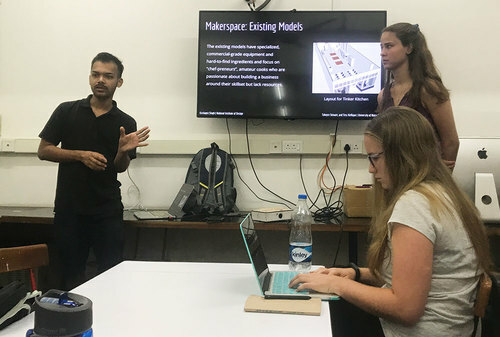 Therese Nelligan, Takeyra Stewart, and Kushagra Singh interview students at the Gujarat Vidyapith university for their design project. When Kacey Hengesbach began her undergraduate career at Notre Dame, she didn’t imagine that it would include traveling 8,000 miles to Ahmedabad, India. But thanks to a new course created by Neeta Verma, the Robert P. Sedlack Jr. 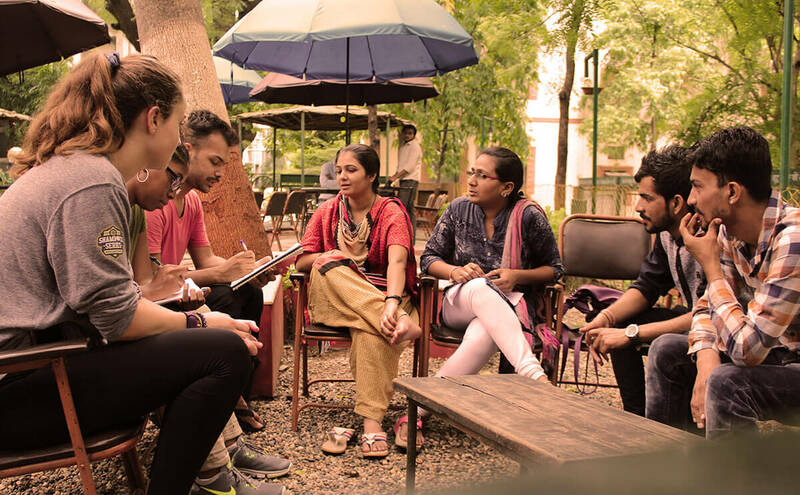 Associate Professor in the Department of Art, Art History, and Design, she had the chance to spend three weeks there last summer, working collaboratively with students from India’s National Institute of Design. Kushagra Singh and Tess Nelligan present their preliminary research into existing solutions enabling a healthy lifestyle by reducing the use of processed food. Hengesbach and the other students in Verma’s Social Design course continued their partnership with the NID students throughout the fall semester, hosting them for a two-week visit to Notre Dame in September and communicating via Skype and email for the remainder of the course. 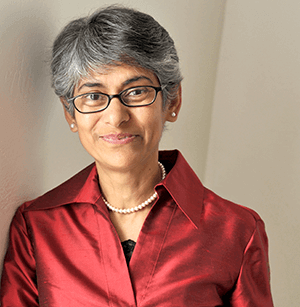 The idea behind the course, which Verma is planning to offer again, is to tackle a singular, global problem — like sustainability — and examine it from both a U.S. and Indian perspective. Setting up the exchange between Notre Dame and the National Institute of Design was a critical part of the course, she said, because it created a reciprocal engagement that was beneficial for both sets of students. 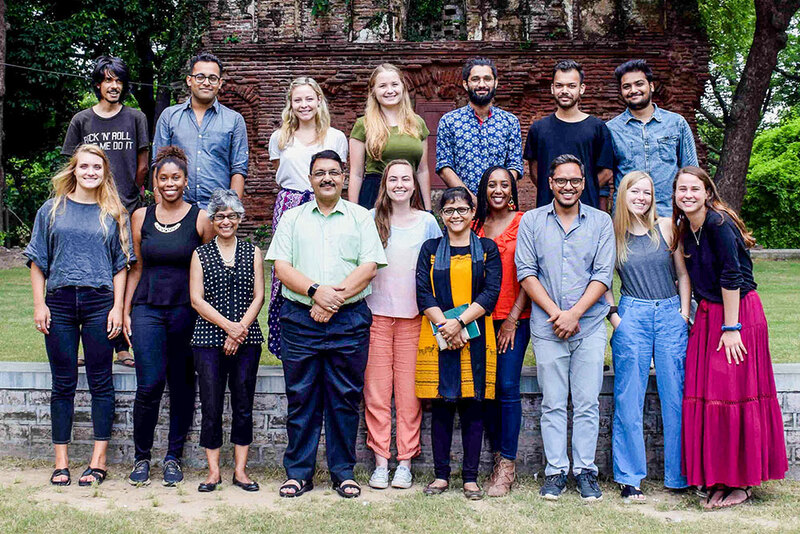 When the students first met in India, they formed six teams — each comprised of at least one Notre Dame student and one NID student — and began exploring various issues related to sustainability. The teams conducted site visits and interviews in both countries to research topics like sustainable packaging and the journey of food from farm to table. After both visits, the students communicated via Skype to transform their research into possible solutions and explore design interventions. Snarponis and her partner, Sonu Yadav, worked on the concept of sustainable bedding, presenting a project that would recycle old clothing to create blankets. For Takeyra Stewart, a senior design major, the process of designing across cultures led to some surprises. Her team’s project focused on encouraging young adults to learn cooking skills in order to reduce reliance on processed foods. “I think how we designed was the most interesting part,” she said. “Even when we were working on the color scheme, if I just think of the word ‘food,’ I think about the color green, like vegetables and plants. But my partner in India thinks about the color red, because food is very warm. Just seeing the cultural differences in certain words or ideas was fun. Therese Nelligan in the field, documenting self-sustainable methods for meal preparation at the Gu student taking photographs for a Social Design project. Even when the teams experienced technical difficulties — slower internet speeds in India that made it difficult for them to exchange large files or photos, for example — the students took it in stride. That kind of thinking is a fundamental component of the design process, Verma said, and one of the reasons the course is valuable for students from all fields. The first cohort included majors in anthropology, psychology, and business, as well as design majors. Verma, who came to Notre Dame in 2016, sees the Social Design course as a natural fit for the University. Students and faculty from India’s National Institute of Design and Notre Dame. Originally published by Carrie Gates at al.nd.edu on June 26, 2018.